The opposition is trying to obtain petty political advantages by misleading the public by undermining the arrest of General Sarath Fonseka. He was arrested under Military Act 57 (1) which states that even a retired military officer can be taken into custody if he had divulged secrets or acted against the government while serving in the Army. 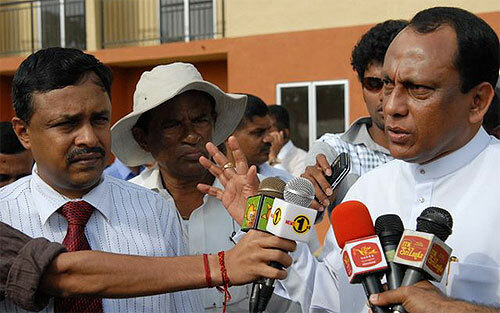 This incident does not amount to political vengeance, Minister of Media Lakshman Yapa Abeywardena said. Addressing a media conference held at the Ministry of Mass Media and Information, the Minister explained that the former Army Chief was arrested by the Military Police, as investigations into his conduct while in the Army were launched only after he retired from military service. Minister stated that any Army officer or a soldier who commits an offence during his/her service time and the time period thereafter subject to military law may be taken into custody under Article 57(1) of the Army Act as shown below. A Court Martial or legal proceedings will continue thereafter. When a journalist querried about why General Fonseka was not arrested for his offences while he was CDS, Minister Abeywardena said when a complaint is lodged against a person on allegations, there is a legal procedure to follow. Initially, evidence had to be gathered and verified. "We have credible evidence and information now. After his resignation as CDS, General Fonseka was a Presidential candidate. Charging him then, would have been misinterpreted as political vengeance" he added. He observed that Fonseka's lawyer as well as a family member have been granted permission to visit him.